Intent: Character assistant for Fleet RP both combat and non-combat, organization, and development. Appearance: Medium height with short black hair and red eyes, always immaculate in or out of uniform, meticulous about professional appearance at all times. Wealth: Moderately wealthy on generous Admiral's salary and combat and active duty pay. Notable Possessions: Collection of medals and commendations, both CEDF and Clan Australis. Skills: Trained in command with Chiss Expansionary Defence Force. Thirty years fleet service, ten with Clan Australis. Personality: Cool, calm and professional demeanour. Unflappable, somewhat acidic when faced with incompetence, but otherwise pleasant and well-spoken. Auriana holds herself to extremely high standards, and expects the beings serving with her to act accordingly. Weapon of Choice: Capital ships. Combat Function: While Auriana has military training in hand-to-hand combat and certain cross-training with ground units, she is a fleet commander, not a front line soldier, and is most competent with her service weapon. Auriana was born on Csilla, and grew up in the household of a successful Syndic. Her family served a larger wealthier family, who served as her patron to sponser her entry to the CEDF academy. Her passage was hard, as the daughter of comparitively poor parents, she experienced social isolation. This however allowed her to develop a successful work ethic, and she began to excel, being forwarded to the command training program, and graduating second in her class. Auriana served with the CEDF, reaching her own command. 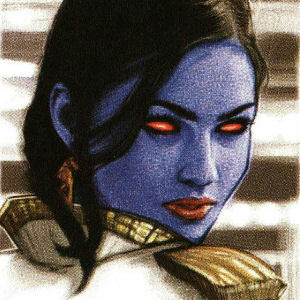 Political intrigues within the Chiss Ascendancy, however, forced her to resign her commission, and when she was sent on a diplomatic mission to the Core, exile in all but name, she encountered Kaine Australis, and he successfully recruited her to command the Clan's burgeoning fleet. Serving together in over a dozen major engagements, the two built a relationship of mutual trust and respect, despite their vastly different personalities and approaches to strategy. Kaine and Auriana found their divergent strengths complimented one another well, and the benefit was to Clan Australis. Auriana was promoted to Commodore, then Admiral, by Kaine, who proudly entrusted her with the role of Fleet commander, with overall command of all Clan naval forces. A role she has served in with pride for the past several years. Edited by Kaine Australis, 22 February 2018 - 08:22 AM.